I was confused by noontime when all of a sudden I heard a loud boom and the steel door banged so loud as if someone went amok outside! My husband turned on the TV in the living room and right then, I realized the source of the sound. The Discovery returns to Earth from its FINAL mission. 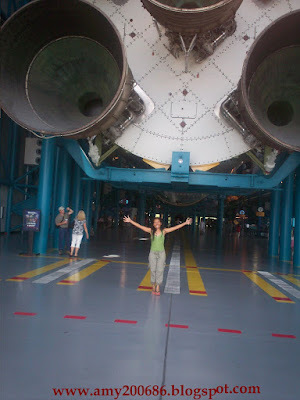 The picture below is just to show you how tiny I am under this gigantic rocket display. Anyway, Discovery is the oldest flying space shuttle and the most traveled winged spaceship in the fleet. It has 39 missions and has been flying for 27 years. 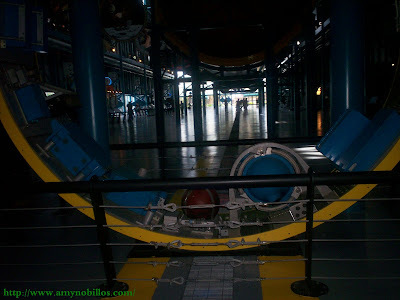 The picture above was taken at the Kennedy Space Center in Florida. 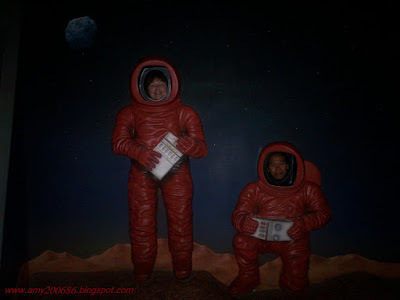 We landed safely to earth, don't you think. Showing the thickness and how huge the body of the rocket is. Maybe, on the last flight my hubby and I will be there. It will be held in June. Crossing my fingers by now.